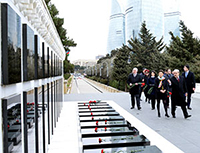 During the visit, the Georgian Minister laid a wreath at the grave of national leader Heydar Aliyev in the Alley of Honor dearly remembering his memory. They also put sweaty flowers on the grave of prominent ophthalmologist, academician Zarifa Aliyeva remembering her memory. The guest also visited the graves of our compatriots who died for the independence and territorial integrity of our country in the Alley of Martyrs and laid a wreath at the Eternal Torch Monument. Ms. 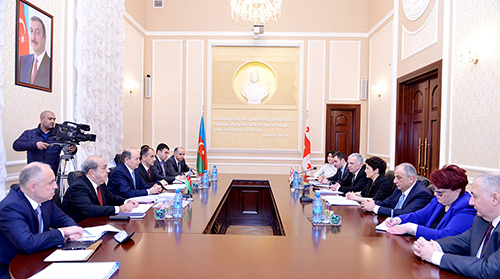 Tea Tsulukiani met with Minister of Justice of Azerbaijan, Chairman of Judicial-Legal Council Fikrat Mammadov. Emphasizing the efficient friendship and cooperation relations between two countries and great prospects for deepening legal relations, Minister F. Mammadov, noted the special role of our presidents in the development of these relations and recalled his remarks at the international conference and forums. Minister informed about the large-scale judicial-legal reforms under the leadership of the President of the country Mr. Ilham Aliyev, including the most transparent selection of judges in Europe, the application of electronic courts, the activities of the administrative justice. He also talked about ensuring transparency in the judicial system, open government promotion, public participation, as well as anti-corruption measures, including the activities of ASAN Service on promotion of citizen satisfaction, a brand of Azerbaijan and place where justice services are also provided. Expressing her satisfaction with her visit to Azerbaijan Minister T. Tsulukiani underlined the development of relations between our friendly countries in different directions and always supported each other in international organizations. Noting effective bilateral activity between two countries judicial organs in legal aid and other spheres the guest expressed confidence that these relations will continue successfully. She appreciated the achievements of Azerbaijan in the field of justice and court, showing interest in positive experience in this field, including the application of the electronic court. Noting the importance of exchanging experience and readiness for expanding bilateral activity the minister informed about the implemented reforms in her country s justice and judicial system. The sides exchanged views on the prospects of cooperation between the judicial authorities of the two countries, including legislation improvement, civil society development, application of the mediation institute and other issues. Georgia s Ambassador to Azerbaijan Teymuraz Sharashenidze attended the event. The guests acquainted with the Museum of Justice History at the Ministry of Justice. On the same day Ms. T. Tsulukiani had official meetings in Parliament, in the Ministry of Foreign Affairs and other official meetings. Within the framework of the visit, the Georgian delegation will also familiarize with activity of ASAN service, which is a brand of Azerbaijan and provides the citizens satisfaction, as well as historical and cultural monuments of Baku, including the Heydar Aliyev Center.